The development of asthma and resulting asthma severity are governed by complex interactions between genetic and environmental factors. The key pathophysiological features of asthma pathology are lung inflammation, airway hyper-responsiveness, airway remodelling and mucous hypersecretion, all of which contribute to variable airflow limitation. Importantly, it is increasingly recognised that asthma is not a single or homogenous disease, but is better thought of as a condition that may arise as a combination of variations of the key pathophysiological features described above (Trejo Bittar et al. 2015, Israel et al. 2017). Severe asthma is certainly no different in this respect; indeed, the recognition and measurement of this pathophysiological heterogeneity is increasingly important in terms of determining effective personalized treatment. Increased risk of developing asthma has been associated with respiratory virus infection in childhood, allergic sensitisation, reduced lung function, smoke exposure and a family history of asthma. However, what effect these factors have on the development of severe asthma remains unclear. By definition, inflammation of the airway tissue and lumen in severe asthma is resistant to treatment with traditional inhaled corticosteroid medication, and in some instances, oral corticosteroids. Inflammation of the airway tissue and lumen in severe asthma is heterogeneous. The best understood type of airway inflammation in asthma is referred to as ‘Type 2’ inflammation, which is estimated to occur in up to 50% of people with severe asthma. The term ‘Type 2’ stems from early studies that demonstrated that asthma inflammation was associated with increased type-2 helper CD4+ T lymphocytes (TH2), which generate the cytokines interleukin (IL)-4, -5 and -13. IL-4, -5 and -13 that drive the lung tissue and airway eosinophilia which characterises Type 2 asthma. The importance of Type 2 inflammation as a causal factor in the clinical manifestations of severe asthma (particularly the occurrence of frequent severe exacerbations or flare-ups) has been demonstrated in recent clinical trials of targeted biological therapies designed to inhibit IL-5-, IL-13- or both IL-4- and IL-13-mediated inflammation (Fricker et al. 2017). Type-2 inflammation is often associated with increased eosinophil numbers. For more information see Monoclonal Antibodies. Although Type 2 inflammation and TH2 lymphocyte activation in asthma can be driven by atopy and allergic responses, Type 2 inflammation also frequently occurs independently of atopy. The mechanisms that govern non-atopic Type 2 inflammation in asthma are less well understood, however it is thought that both atopic and non-atopic Type 2 asthma respond to new targeted therapies against IL-5 or IL-4/-13. Alternatively, asthma can be associated with increased numbers of neutrophils. 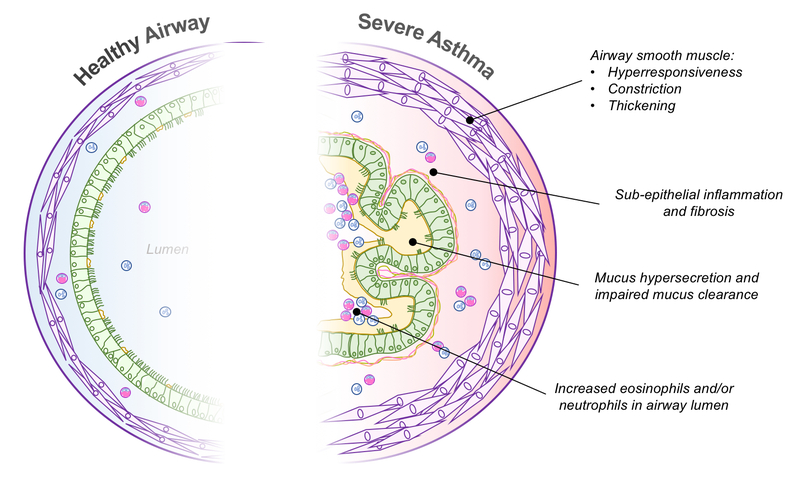 The mechanisms that govern neutrophilic inflammation in severe asthma, and the potential contribution of elevated neutrophils to clinical outcomes in severe asthma are less well understood. However, there is growing recognition that neutrophilic inflammation in asthma can be driven by activation of Type-1 TH1 cells, which produce IFNγ, or IL-17-producing TH17 cells. Finally, around 30-40% of severe asthma patients do not have overt Type 2 or neutrophilic inflammation, and the potential role that altered inflammatory pathways play in this severe asthma subpopulation remains poorly understood. In individuals with asthma, the airways have an abnormal and exaggerated response to a trigger. The trigger may be an allergen, irritant or other triggers such as pollution, exercise and/or infection. Upon exposure to a trigger, a complex cascade of events results in localised release of inflammatory mediators (e.g. histamine, interleukins, prostaglandins, leukotrienes and nitric oxide). In addition to promoting tissue inflammation, these mediators act on local nerves and smooth muscle cells to initiate muscle contractions and airway narrowing. Chronic inflammation associated with asthma also results in long-term and ongoing structural changes within the lung. Increased numbers of mucus-secreting goblet cells in the bronchial epithelial layer secrete mucus, which along with impaired mucociliary clearance mechanisms cause a build-up of mucus in the airway lumen that can restrict airflow and increase susceptibility of patients to airway infections. Further, airway wall remodelling is observed, which include increased subepithelial fibrosis (particularly in those patients with high eosinophilic airway inflammation) and increased smooth muscle mass. In addition airway smooth muscle may become hyperresponsive, and the extent of airway smooth muscle build up has been proposed to correlate with asthma severity. Of note, airway remodelling, like inflammation, is not uniform in severe asthma.